To the west of Bourg-Lès-Valence, the old river island of Girodet has undergone redevelopment to become a lively public place. 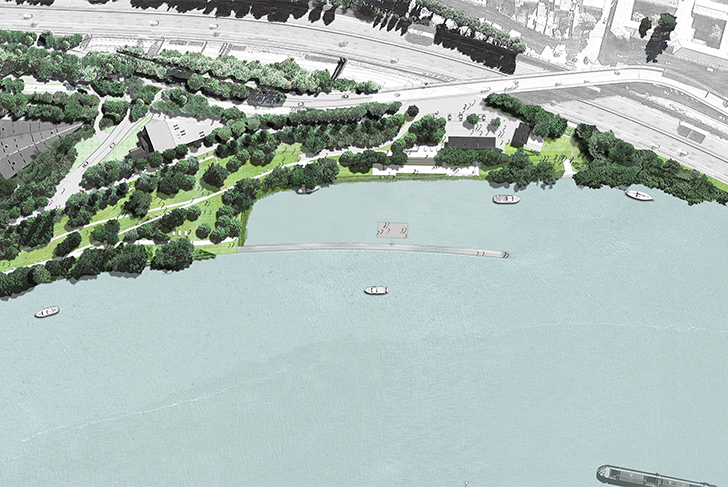 The influence of the Rhône river on the city center, along with the collective memory of insularity, fostered a desire to rediscover a certain natural geography. Our project adheres to a simple line: take advantage of the large landscape entities that characterize the river valley, its riparian woodlands and views into the distance. The vegetal choices and implementation strategy, the organizational design logic, the adoption of new landscape uses, anchor the island within the vast territory surrounding, bringing to light its environmental attributes. Girodet Island is here considered in its entirety as one and the same park. Its naturalistic forms and forested cordons highlight the forgotten contours of the island. The riparian woodlands and the masses of existing trees are sculpted and/or thickened, with their outlines magnified as a result. 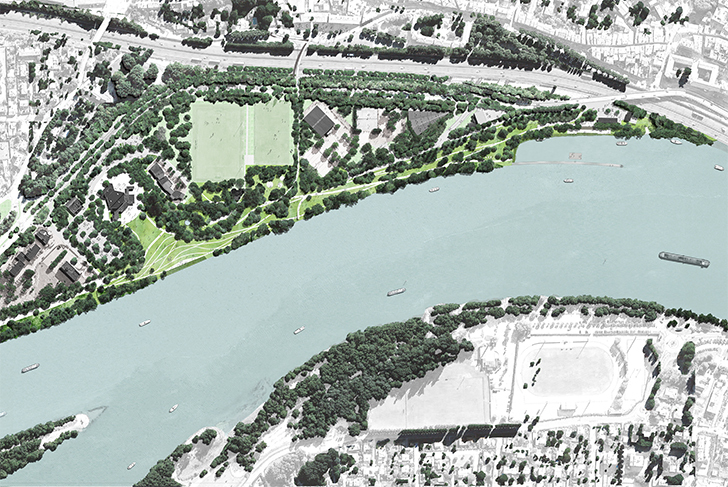 This vegetal abundance inspired by the natural spaces of the Rhône valley functions in modifying and counterbalancing the excessiveness of the surrounding road infrastructure as well as the feeling that the river has been largely canalized. The composition of an “amplified” geography is fundamental for us: it makes the site into a clearly identifiable destination, spatially recognizable. But it also serves a pragmatic purpose: helping the site adapt to all kinds of uncertainties (programatic changes, variations or restrictions as to its perimeters, hazards involved during construction...), while imparting an immediate sense of quality to the created public spaces. To the west, the riparian woodlands are interrupted at two strategic points: one when facing a theater and one on an axis with a footbridge, functioning in opening up the park upon the river and creating views into the distance. To the east, the woodlands spread along the infrastructure of roads. The planted rows already in existence are transformed into impressive groves housing recreational elements and specific garden furniture. 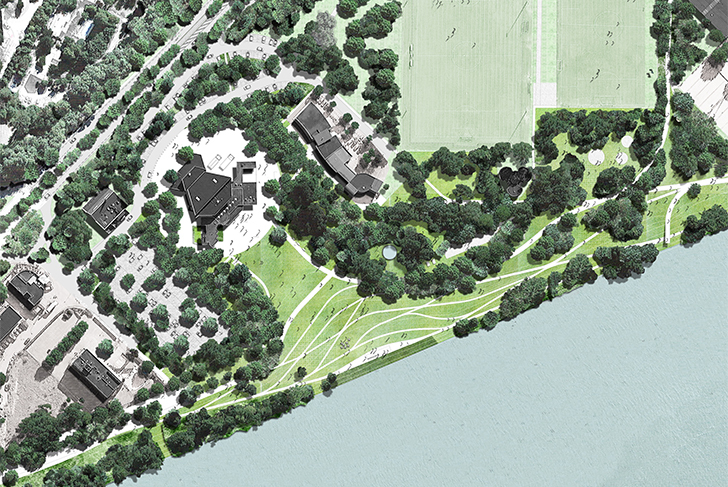 Our vegetal strategy also works in integrating the functional spaces, such as the theater parking lot, into the landscape, while redeveloping the main departmental road into a genuine parkway. 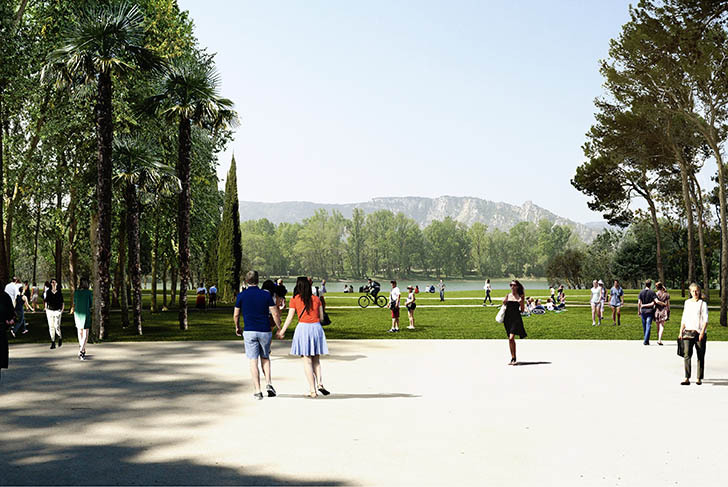 From north to south, the naturalist park physically connects the cultural and sporting facilities, making them parts of the same entity. 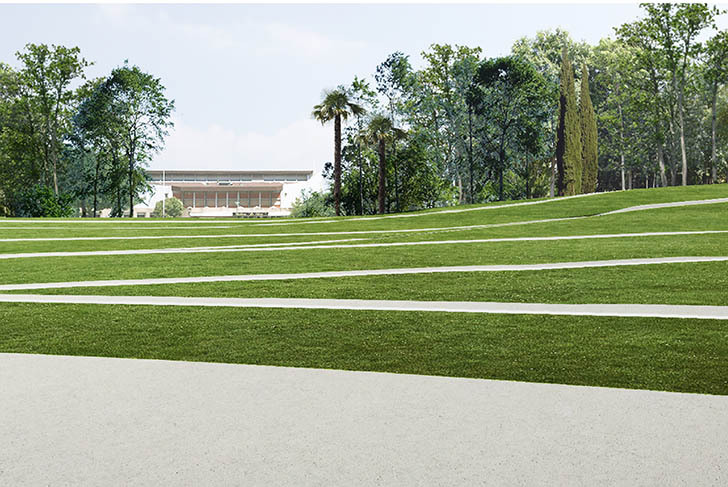 The meadow is traversed by winding paths – an upper promenade, a lower promenade, and secondary branchings off. An esplanade is converted into a large open lawn, located at the point where a square and the broad low quay meet. 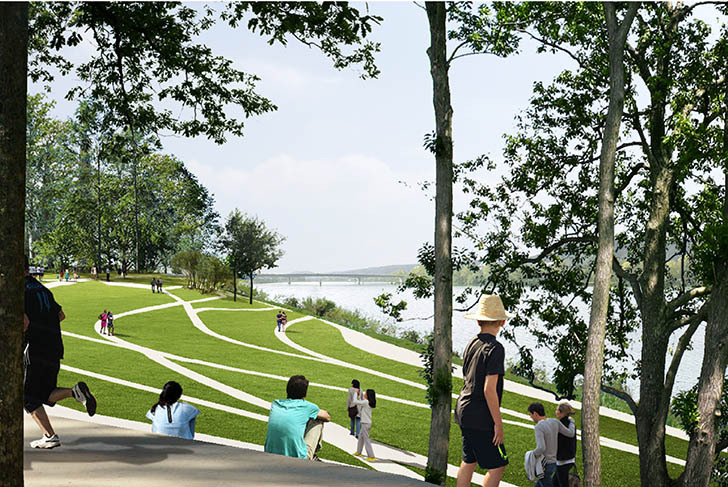 The shaped topography of the riverbank creates a comfortable expanse, free from all obstacle, whose gentle slope resolutely turns the site towards the river.